Q1 : What is the force between two small charged spheres having charges of 2 x 10-7 C and 3 x 10-7 C placed 30 cm apart in air? Hence, force between the two small charged spheres is 6 × 10-3 N. The charges are of same nature. Hence, force between them will be repulsive. Q2 : The electrostatic force on a small sphere of charge 0.4 micro coulomb due to another small sphere of charge -0.8 micro coulomb in air is 0.2 N.
a) What is the distance between the two spheres? b) What is the force on the second sphere due to the first? This comes to be -0.2 N, negative sign implying the attractive nature of force. This conforms to Newton’s third law. Q3 : Check that the ratio ke2/G memp is dimensionless. Look up a Table of Physical Constants and determine the value of this ratio. What does the ratio signify? Its unit is N m2 kg– 2.
me and mp = Masses of electron and proton. Its unit is N m2 C-2. Hence, the given ratio is dimensionless. This is the ratio of electric force to the gravitational force between a proton and an electron, keeping distance between them constant. Q4 : (a) Explain the meaning of the statement ‘electric charge of a body is quantised’. (a) Electric charge of a body is quantized. This means that only integral (1, 2, …., n) number of electrons can be transferred from one body to the other. Charges are not transferred in fraction. Hence, a body possesses total charge only in integral multiples of electric charge. (b) In macroscopic or large scale charges, the charges used are huge as compared to the magnitude of electric charge. Hence, quantization of electric charge is of no use on macroscopic scale. Therefore, it is ignored and it is considered that electric charge is continuous. Q5 : When a glass rod is rubbed with a silk cloth, charges appear on both. A similar phenomenon is observed with many other pairs of bodies. Explain how this observation is consistent with the law of conservation of charge. Rubbing produces charges of equal magnitude but of opposite nature on the two bodies because charges are created in pairs. This phenomenon of charging is called charging by friction. The net charge on the system of two rubbed bodies is zero. This is because equal amount of opposite charges annihilate each other. When a glass rod is rubbed with a silk cloth, opposite natured charges appear on both the bodies. This phenomenon is in consistence with the law of conservation of energy. A similar phenomenon is observed with many other pairs of bodies. 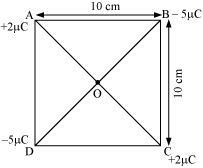 Q6 : Four point charges qA = 2 µC, qB = –5 µC, qC = 2 µC, and qD = –5 µC are located at the corners of a square ABCD of side 10 cm. 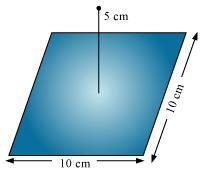 What is the force on a charge of 1 µC placed at the centre of the square? The given figure shows a square of side 10 cm with four charges placed at its corners. O is the centre of the square. A charge of amount 1 µ¼C is placed at point O. Force of repulsion between charges placed at corner A and centre O is equal in magnitude but opposite in direction relative to the force of repulsion between the charges placed at corner C and centre O. Hence, they will cancel each other. Similarly, force of attraction between charges placed at corner B and centre O is equal in magnitude but opposite in direction relative to the force of attraction between the charges placed at corner D and centre O. Hence, they will also cancel each other. Therefore, net force caused by the four charges placed at the corner of the square on 1 µC charge at centre O is zero. Q7 : (a) An electrostatic field line is a continuous curve. That is, a field line cannot have sudden breaks. Why not? (a) An electrostatic field line is a continuous curve because a charge experiences a continuous force when traced in an electrostatic field. The field line cannot have sudden breaks because the charge moves continuously and does not jump from one point to the other. (b) If two field lines cross each other at a point, then electric field intensity will show two directions at that point. This is not possible. Hence, two field lines never cross each other. Q8 : Two point charges qA = 3 µC and qB = -3 µC are located 20 cm apart in vacuum. (b) If a negative test charge of magnitude 1.5 x 10-9 C is placed at this point, what is the force experienced by the test charge? (a) The situation is represented in the given figure. O is the mid-point of line AB. Therefore, the electric field at mid-point O is 5.4 × 106 N C-1 along OB. (b) A test charge of amount 1.5 × 10-9 C is placed at mid-point O. The force is directed along line OA. This is because the negative test charge is repelled by the charge placed at point B but attracted towards point A. Therefore, the force experienced by the test charge is 8.1 × 10-3 N along OA. Q9 : A system has two charges qA = 2.5 x 10-7 C and qB = -2.5 x 10-7 C located at points A: (0, 0, – 15 cm) and B: (0, 0, + 15 cm), respectively. What are the total charge and electric dipole moment of the system? Both the charges can be located in a coordinate frame of reference as shown in the given figure. Therefore, the electric dipole moment of the system is 7.5 x 10-8 C m along positive z-axis. Q10 : An electric dipole with dipole moment 4 x 10-9 C m is aligned at 30° with the direction of a uniform electric field of magnitude 5 x 104 N C-1. Calculate the magnitude of the torque acting on the dipole. Therefore, the magnitude of the torque acting on the dipole is 10 N m.
Q11 : A polythene piece rubbed with wool is found to have a negative charge of 3 x 10-7 C.
(a) When polythene is rubbed against wool, a number of electrons get transferred from wool to polythene. Hence, wool becomes positively charged and polythene becomes negatively charged. Therefore, the number of electrons transferred from wool to polythene is 1.87 × 1012. Hence, a negligible amount of mass is transferred from wool to polythene. Q12 : (a) Two insulated charged copper spheres A and B have their centers separated by a distance of 50 cm. What is the mutual force of electrostatic repulsion if the charge on each is 6.5 x 10-7 C? The radii of A and B are negligible compared to the distance of separation. Therefore, the force between the two spheres is 1.52 × 10-2 N.
The distance between the spheres is halved. Therefore, the force between the two spheres is 0.243 N.
Q13 : Suppose the spheres A and B in Exercise 1.12 have identical sizes. A third sphere of the same size but uncharged is brought in contact with the first, then brought in contact with the second, and finally removed from both. What is the new force of repulsion between A and B? When sphere A is touched with an uncharged sphere C, q/2 amount of charge from A will transfer to sphere C. Hence, charge on each of the spheres, A and C, is q/2. Each sphere will share each half. Hence, charge on each of the spheres, C and B, is . Therefore, the force of attraction between the two spheres is 5.703 × 10– 3 N.
Q14 : Figure 1.33 shows tracks of three charged particles in a uniform electrostatic field. Give the signs of the three charges. Which particle has the highest charge to mass ratio? Opposite charges attract each other and same charges repel each other. It can be observed that particles 1 and 2 both move towards the positively charged plate and repel away from the negatively charged plate. Hence, these two particles are negatively charged. It can also be observed that particle 3 moves towards the negatively charged plate and repels away from the positively charged plate. Hence, particle 3 is positively charged. The charge to mass ratio (emf) is directly proportional to the displacement or amount of deflection for a given velocity. Since the deflection of particle 3 is the maximum, it has the highest charge to mass ratio. Q15 : Consider a uniform electric field E = 3 x 103 î N/C. (a) What is the flux of this field through a square of 10 cm on a side whose plane is parallel to the yz plane? (b) What is the flux through the same square if the normal to its plane makes a 60° angle with the x-axis? (a) Electric field intensity, = 3 × 103 î N/C. Q16 : What is the net flux of the uniform electric field of Exercise 1.15 through a cube of side 20 cm oriented so that its faces are parallel to the coordinate planes? All the faces of a cube are parallel to the coordinate axes. Therefore, the number of field lines entering the cube is equal to the number of field lines piercing out of the cube. As a result, net flux through the cube is zero. Q17 : Careful measurement of the electric field at the surface of a black box indicates that the net outward flux through the surface of the box is 8.0 x 103 N m2/C. (a) What is the net charge inside the box? (b) If the net outward flux through the surface of the box were zero, could you conclude that there were no charges inside the box? Why or Why not? Therefore, the net charge inside the box is 0.07 μC. Net flux piercing out through a body depends on the net charge contained in the body. If net flux is zero, then it can be inferred that net charge inside the body is zero. The body may have equal amount of positive and negative charges. The square can be considered as one face of a cube of edge 10 cm with a centre where charge q is placed. According to Gauss’s theorem for a cube, total electric flux is through all its six faces. Therefore, electric flux through the square is 1.88 × 105 N m2 C– 1. Q19 : A point charge of 2.0 μC is at the centre of a cubic Gaussian surface 9.0 cm on edge. What is the net electric flux through the surface? The net electric flux through the surface is 2.26 ×105 N m2C– 1. Q20 : A point charge causes an electric flux of -1.0 x 103 Nm2/C to pass through a spherical Gaussian surface of 10.0 cm radius centered on the charge. (a) If the radius of the Gaussian surface were doubled, how much flux would pass through the surface? (b) What is the value of the point charge? Electric flux piercing out through a surface depends on the net charge enclosed inside a body. It does not depend on the size of the body. If the radius of the Gaussian surface is doubled, then the flux passing through the surface remains the same i.e., – 103 N m2/C. Therefore, the value of the point charge is – 8.854 nC. Q21 : A conducting sphere of radius 10 cm has an unknown charge. If the electric field 20 cm from the centre of the sphere is 1.5 x 103 N/C and points radially inward, what is the net charge on the sphere? Therefore, the net charge on the sphere is 6.67 nC. Q22 : A uniformly charged conducting sphere of 2.4 m diameter has a surface charge density of 80.0 μC/m2. (a) Find the charge on the sphere. (b) What is the total electric flux leaving the surface of the sphere? Therefore, the charge on the sphere is 1.447 × 10– 3 C.
Therefore, the total electric flux leaving the surface of the sphere is 1.63 × 108 N C– 1 m2. Q23 : An infinite line charge produces a field of 9 x 104 N/C at a distance of 2 cm. Calculate the linear charge density. Therefore, the linear charge density is 10μC/m. Q24 : Two large, thin metal plates are parallel and close to each other. On their inner faces, the plates have surface charge densities of opposite signs and of magnitude 17.0 x 10-22 C/m2. What is E: (a) in the outer region of the first plate, (b) in the outer region of the second plate, and (c) between the plates? The situation is represented in the following figure. A and B are two parallel plates close to each other. Outer region of plate A is labelled as I, outer region of plate B is labelled as III, and the region between the plates, A and B, is labelled as II. In the regions, I and III, electric field E is zero. This is because charge is not enclosed by the respective plates. Therefore, electric field between the plates is 1.92 × 10– 10 N/C. Q25 : An oil drop of 12 excess electrons is held stationary under a constant electric field of 2.55 x 104 N C-1 in Millikan’s oil drop experiment. The density of the oil is 1.26 g cm-3. Estimate the radius of the drop. (g = 9.81 m s-2; e = 1.60 x 10-19 C). Therefore, the radius of the oil drop is 9.82 × 10– 4 mm. Q26 : Which among the curves shown in Fig. 1.35 cannot possibly represent electrostatic field lines? (a) The field lines showed in (a) do not represent electrostatic field lines because field lines must be normal to the surface of the conductor. (b) The field lines showed in (b) do not represent electrostatic field lines because the field lines cannot emerge from a negative charge and cannot terminate at a positive charge. (c) The field lines showed in (c) represent electrostatic field lines. This is because the field lines emerge from the positive charges and repel each other. (d) The field lines showed in (d) do not represent electrostatic field lines because the field lines should not intersect each other. (e) The field lines showed in (e) do not represent electrostatic field lines because closed loops are not formed in the area between the field lines. 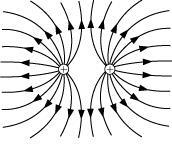 Q27 : In a certain region of space, electric field is along the z-direction throughout. The magnitude of electric field is, however, not constant but increases uniformly along the positive z-direction, at the rate of 105 NC-1 per metre. What are the force and torque experienced by a system having a total dipole moment equal to 10-7 Cm in the negative z-direction? The force is – 10– 2 N in the negative z-direction i.e., opposite to the direction of electric field. Hence, the angle between electric field and dipole moment is 180°. Therefore, the torque experienced by the system is zero. Q28 : (a) A conductor A with a cavity as shown in Fig. 1.36(a) is given a charge Q. Show that the entire charge must appear on the outer surface of the conductor. (b) Another conductor B with charge q is inserted into the cavity keeping B insulated from A. Show that the total charge on the outside surface of A is Q + q [Fig. 1.36(b)]. (c) A sensitive instrument is to be shielded from the strong electrostatic fields in its environment. Suggest a possible way. (a) Let us consider a Gaussian surface that is lying wholly within a conductor and enclosing the cavity. The electric field intensity E inside the charged conductor is zero. Let q is the charge inside the conductor and is the permittivity of free space. Therefore, charge inside the conductor is zero. The entire charge Q appears on the outer surface of the conductor. (b) The outer surface of conductor A has a charge of amount Q. Another conductor B having charge +q is kept inside conductor A and it is insulated from A. Hence, a charge of amount – q will be induced in the inner surface of conductor A and +q is induced on the outer surface of conductor A. Therefore, total charge on the outer surface of conductor A is Q + q. (c) A sensitive instrument can be shielded from the strong electrostatic field in its environment by enclosing it fully inside a metallic surface. A closed metallic body acts as an electrostatic shield. Q29 : A hollow charged conductor has a tiny hole cut into its surface. Show that the electric field in the hole is , where is the unit vector in the outward normal direction, and is the surface charge density near the hole. Let us consider a conductor with a cavity or a hole. Electric field inside the cavity is zero. Let E is the electric field just outside the conductor, q is the electric charge, is the charge density, and is the permittivity of free space. Therefore, the electric field just outside the conductor is . This field is a superposition of field due to the cavity and the field due to the rest of the charged conductor. These fields are equal and opposite inside the conductor (E), and equal in magnitude and direction outside the conductor. Therefore, the field due to the rest of the conductor is . Take a long thin wire XY (as shown in the figure) of uniform linear charge density λ. 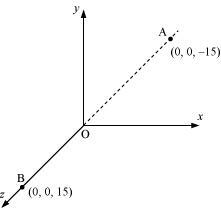 Consider a point A at a perpendicular distance l from the mid-point O of the wire, as shown in the following figure. Let E be the electric field at point A due to the wire, XY. Let q be the charge on this piece. The electric field is resolved into two rectangular components dE cosθ. is the perpendicular component and dE sinθ is the parallel component. When the whole wire is considered, the component dE sinθ is cancelled. Only the perpendicular component dE cosθ affects point A. Hence, effective electric field at point A due to the element dx is dE1. Q31 : It is now believed that protons and neutrons (which constitute nuclei of ordinary matter) are themselves built out of more elementary units called quarks. A proton and a neutron consist of three quarks each. Two types of quarks, the so called ‘up’ quark (denoted by u) of charge (+2/3) e, and the ‘down’ quark (denoted by d) of charge (-1/3) e, together with electrons build up ordinary matter. (Quarks of other types have also been found which give rise to different unusual varieties of matter.) Suggest a possible quark composition of a proton and neutron. A proton has three quarks. Let there be n up quarks in a proton, each having a charge of . Each down quark has a charge of . Therefore, a proton can be represented as ‘uud‘. Number of down quarks is 3 – n,each having a charge of . Therefore, a neutron can be represented as ‘udd’. Q32 : (a) Consider an arbitrary electrostatic field configuration. A small test charge is placed at a null point (i.e., where E = 0) of the configuration. Show that the equilibrium of the test charge is necessarily unstable. (a) Let the equilibrium of the test charge be stable. If a test charge is in equilibrium and displaced from its position in any direction, then it experiences a restoring force towards a null point, where the electric field is zero. All the field lines near the null point are directed inwards towards the null point. There is a net inward flux of electric field through a closed surface around the null point. According to Gauss’s law, the flux of electric field through a surface, which is not enclosing any charge, is zero. Hence, the equilibrium of the test charge can be stable. (b) Two charges of same magnitude and same sign are placed at a certain distance. The mid-point of the joining line of the charges is the null point. When a test charged is displaced along the line, it experiences a restoring force. If it is displaced normal to the joining line, then the net force takes it away from the null point. Hence, the charge is unstable because stability of equilibrium requires restoring force in all directions. Q33 : A particle of mass m and charge ( – q) enters the region between the two charged plates initially moving along x-axis with speed vx (like particle 1 in Fig. 1.33). The length of plate is L and an uniform electric field E is maintained between the plates. Show that the vertical deflection of the particle at the far edge of the plate is qEL2/ (2mv2x). Compare this motion with motion of a projectile in gravitational field discussed in Section 4.10 of Class XI Textbook of Physics. Hence, vertical deflection of the particle at the far edge of the plate is qEL2 / (2mv2x) . This is similar to the motion of horizontal projectiles under gravity. Let the electron strike the upper plate at the end of plate L, when deflection is s.
Therefore, the electron will strike the upper plate after travelling 1.6 cm.